Trends come and go and styles evolve with time but there are a few things that always stay the same, like the fact that fireplaces make us feel cozy or the fact that Christmas is a holiday full of joy and a great opportunity to be good, happy and forgiving, maybe even rediscover the charm of the past by exploring some past styles that you may not be very familiar with. 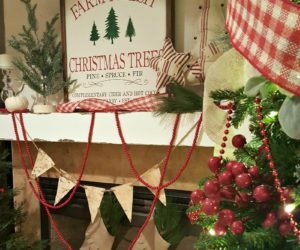 So what do you say…are you ready for a rustic Christmas? 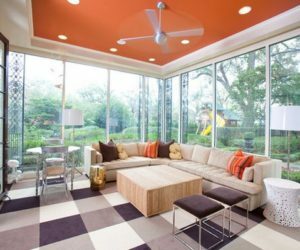 You don’t necessarily have to go all rustic with the decor, especially if you have a modern or contemporary home. 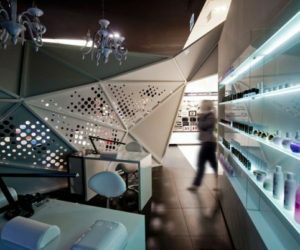 A more eclectic approach can be more suited for the occasion in such a case. 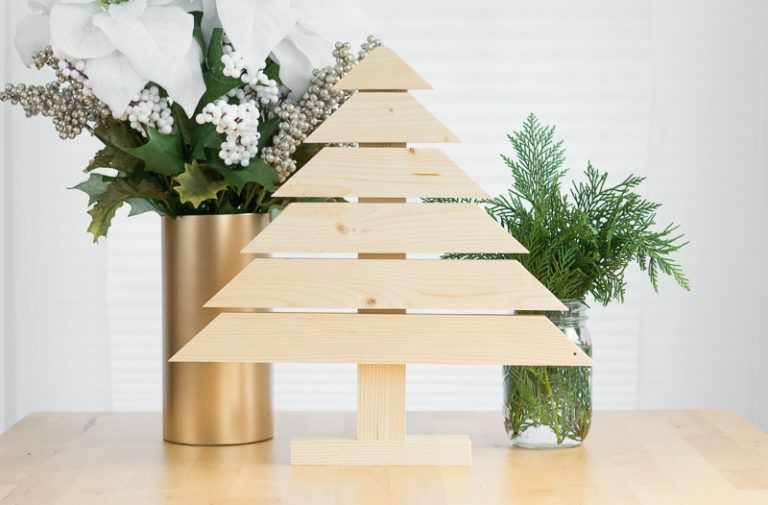 You could decorate the space with things like this little Christmas tree made out of wood. 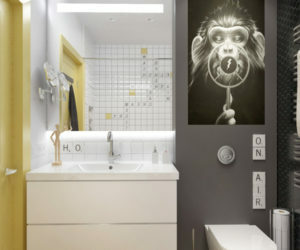 Its clean and simple lines suggest a modern style while the idea itself has a bit of rustic appeal. 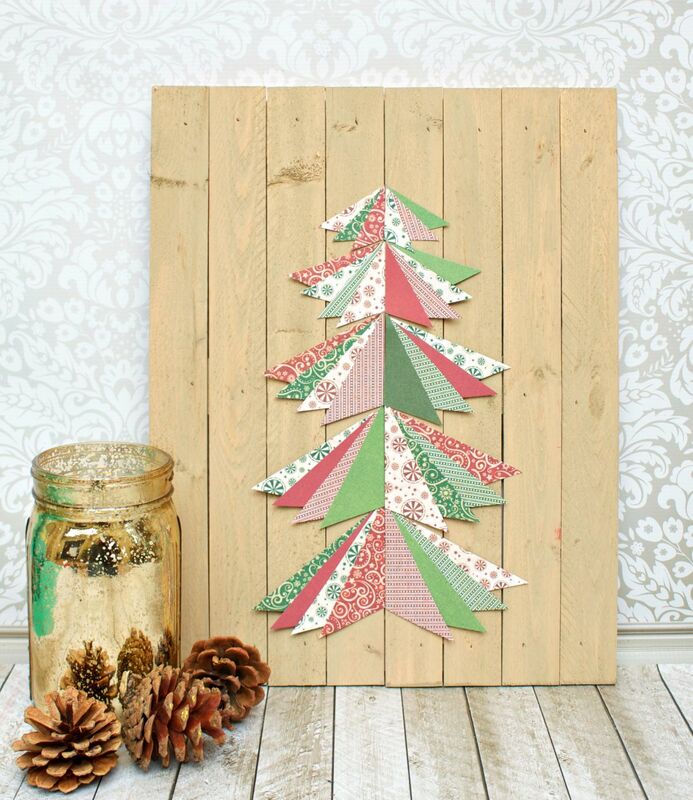 Another idea can be to make a paper tree and to display it on a panel made of wood. Maybe you could use reclaimed boards from an old wooden pallet for this. The tree can be made of patterned paper in holiday-themed colors like green and red. You can use a glue gun to put the pieces together. 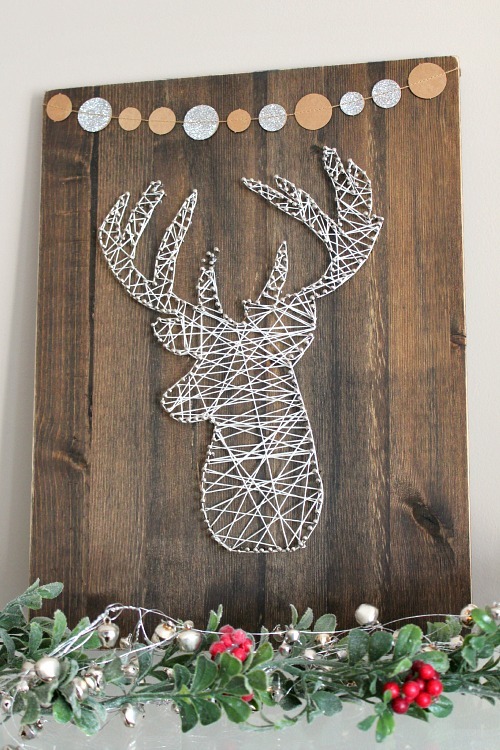 String art has a bit of rustic charm as well. 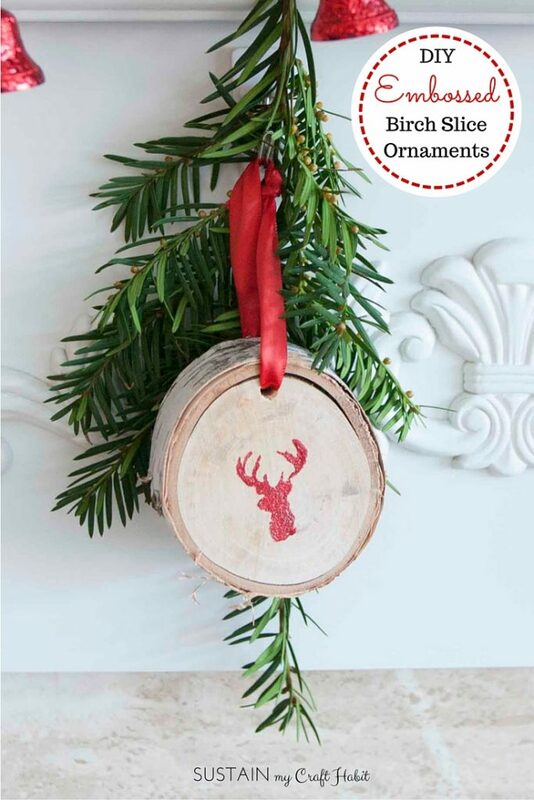 Check out this stylish reindeer that we found on cleanandscentsible. You can make something just as beautiful without much effort. You’d need a piece of wood, dark walnut wood stain, a reindeer head print to use as a template, small nails, a hammer and embroidery thread. 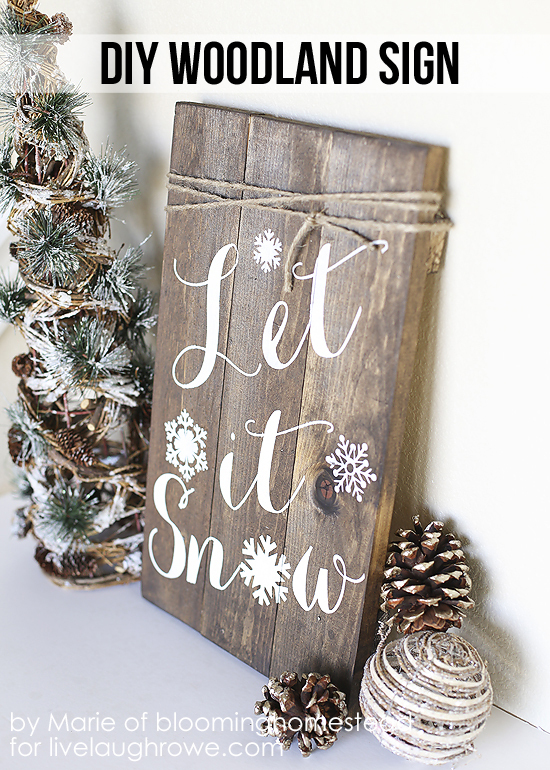 These shadowbox Christmas ornaments can also look great in a rustic setting. 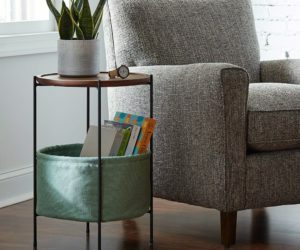 Making something like this is really simple, especially if you already have some wooden boxes which you can use for this. 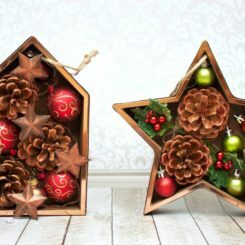 Just fill them with pine cones and some traditional Christmas ornaments and fill the gaps with some fabric embelishments. You can display these on shelves or on the fireplace mantel. How about an advent calendar? 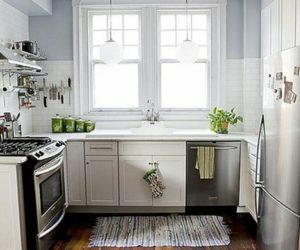 That could look great too especially if you’re aiming at a rustic decor. 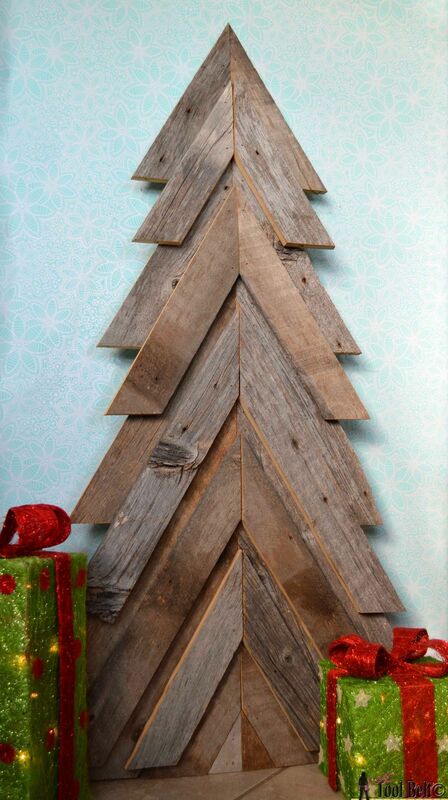 You could make one out of some leftover wood pieces which you can arrange in the form of a Christmas tree. 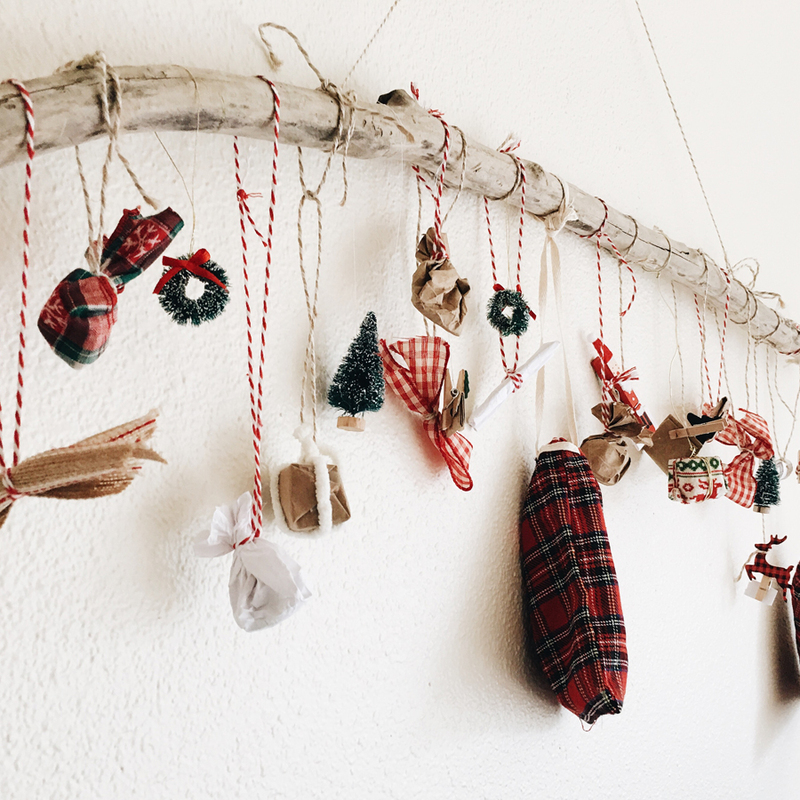 Decorate the tree with a bunch of small bags made of muslin fabric, each with a number painted on them. There’s a more detailed tutorial for this on thediydreamer. 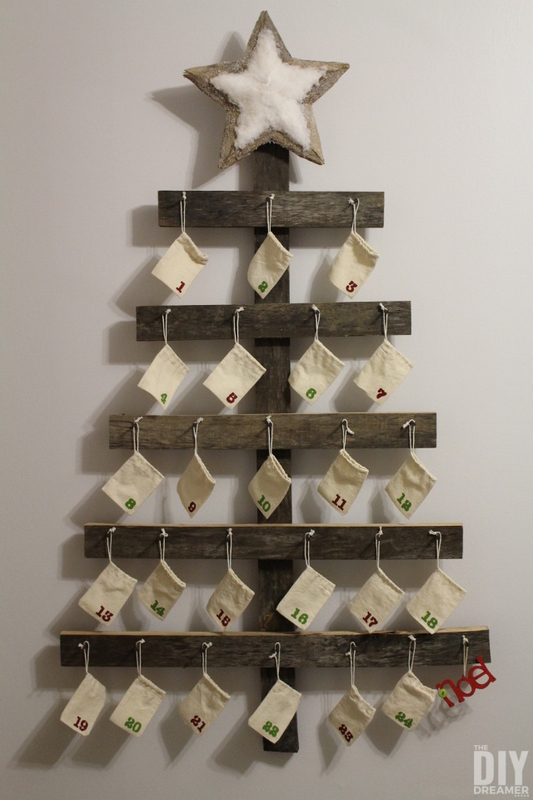 You can use leftover wood or reclaimed pallet boards for a lot of cool things, like this rustic Christmas tree featured on hertoolbelt. 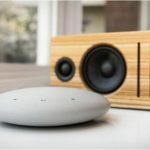 All you need for this project is some wood, a saw, sandpaper, glue and some nails. You can stain or paint the wood if you want but we usually find it better to preserve the original look, especially if aiming for a rustic vibe. Pinecones are great, no matter what style you choose for your Christmas decorations. 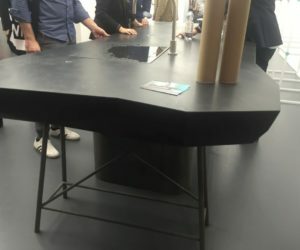 It tends, however, to be easier to integrate them into rustic installations. For instance, you can turn individual pinecones into miniature Christmas trees. 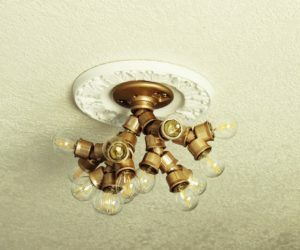 You can use some golden paint to give them a glamorous look. Check out atthepickerfence for additional inspiration. 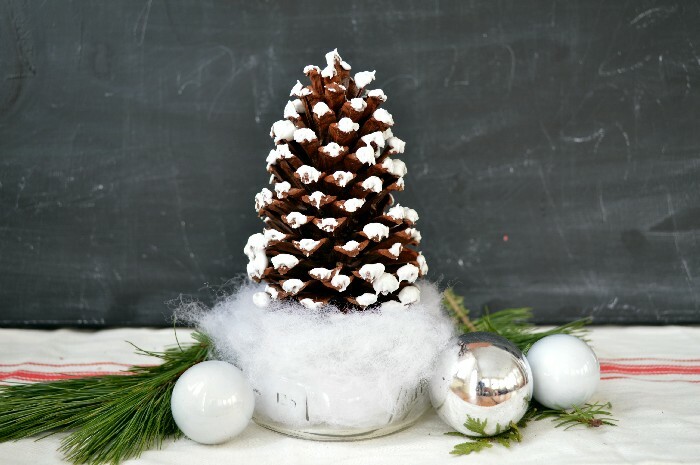 A large and good-looking pinecone can look beautiful on its own and you can turn it into a beautiful Christmas decoration like the one we found on madincrafts. Take the pinecone and put it in a small and wide mason jar. Fill the jar with some cotton batting which kind of looks like snow and paint the tips of the cone white or use faux snow. It will look great. 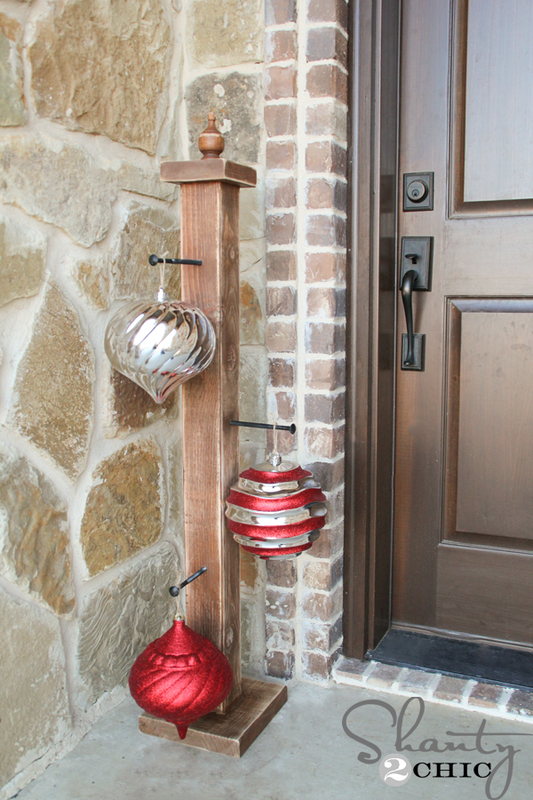 Just what you need for a touch of rustic beauty into your home. 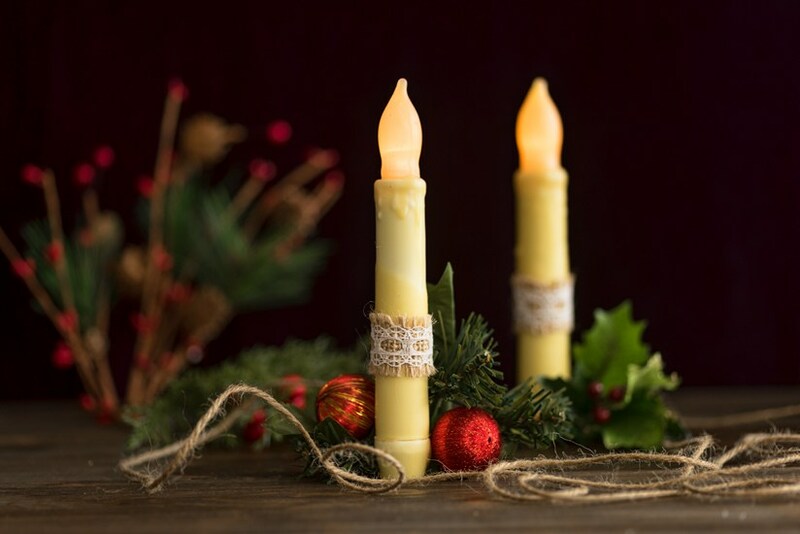 Candles are usually a must-have in a rustic setting and you can focus on this detail for Christmas without getting too caught up in this style. By that we actually mean you can use LED candles instead of the regular kind. It’s a safe option and if you want you can cover them in wax to give them a more authentic look. It’s a trick we learned from natashalh. Wood slices are also pretty great because they’re intrinsically rustic. 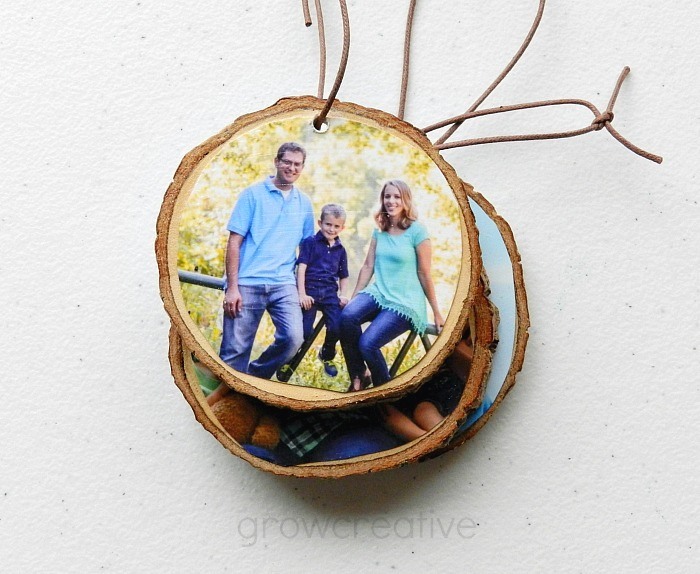 You can use them to craft a lot of cool things, including some personalized Christmas ornaments like the ones we found on growcreativeblog. The other supplies required for this include a drill, mod podge, a foam brush, string and small photos. 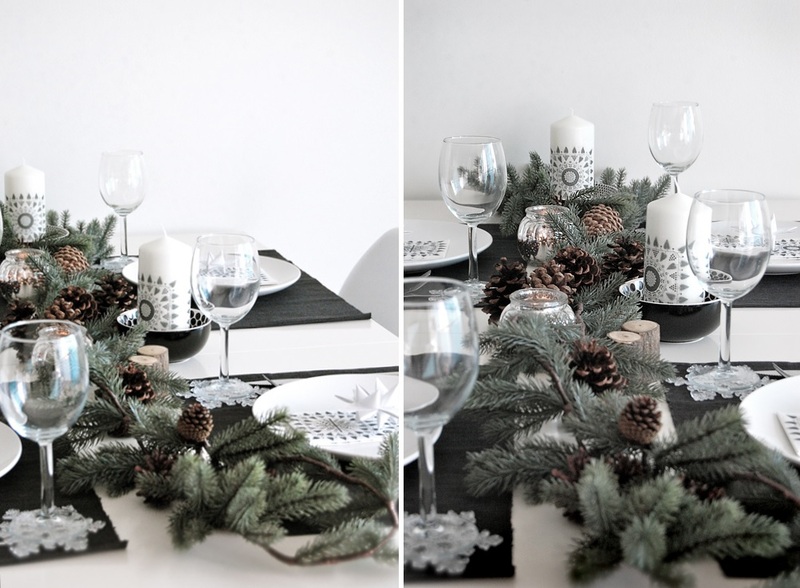 You don’t have to use photos of you or your family if you’d much rather pick something neutral or holiday-themed. 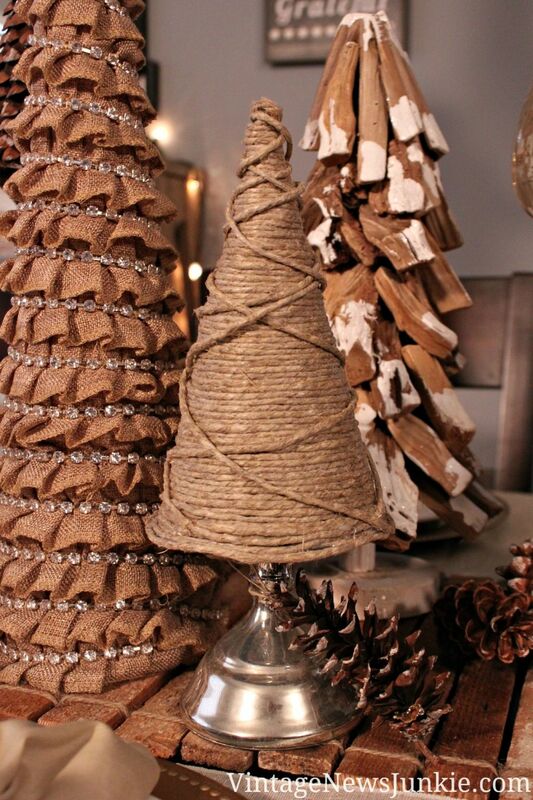 You can wrap just about anything in twine to make it look rustic. For instance, you can make some cool candy cane ornaments for the Christmas tree. It’s a pretty easy task. 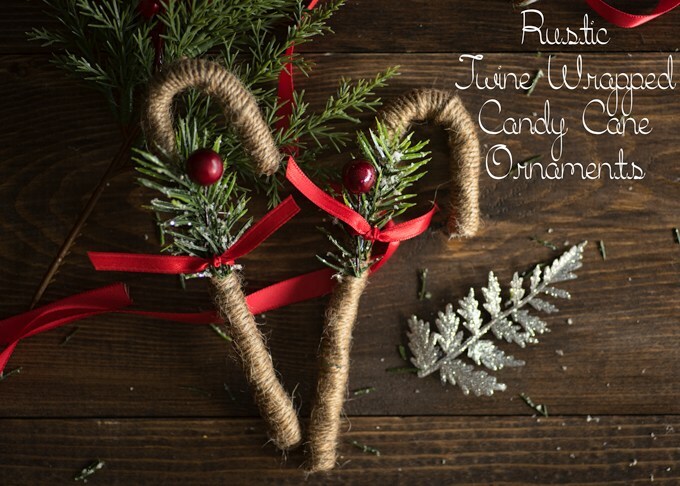 Take some plastic candy canes (it would be a shame to use actual candy), some twine and a hot glue gun. Put a dab of glue on the bottom of the cane and start wrapping twine around, making sure it’s nice and tight. 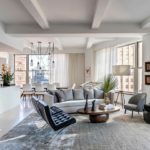 Check out natashalh for tips and details. 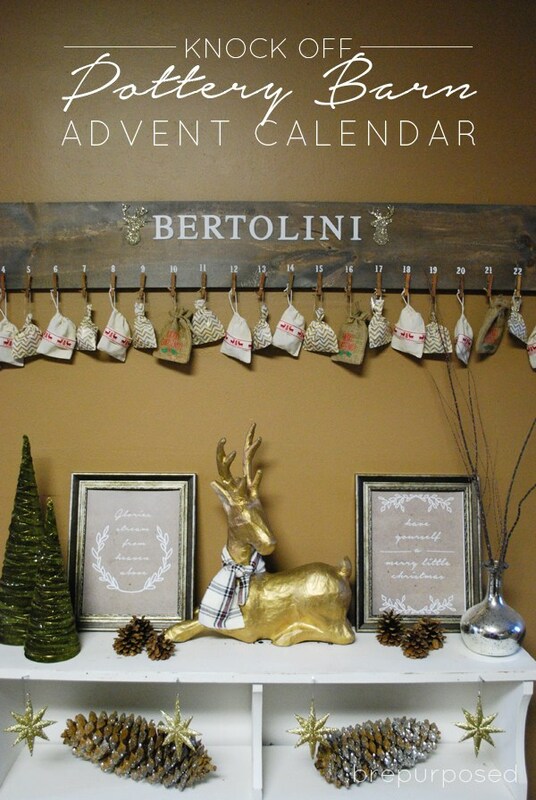 Advent calendars are pretty rustic in nature, although you can definitely make some really cool modern ones as well. We found a lovely project related to this on theanastasiaco and we really want to share it with you. It’s an advent calendar that’s actually a tree branch with a bunch of small treat bags and decorations hanging from it. 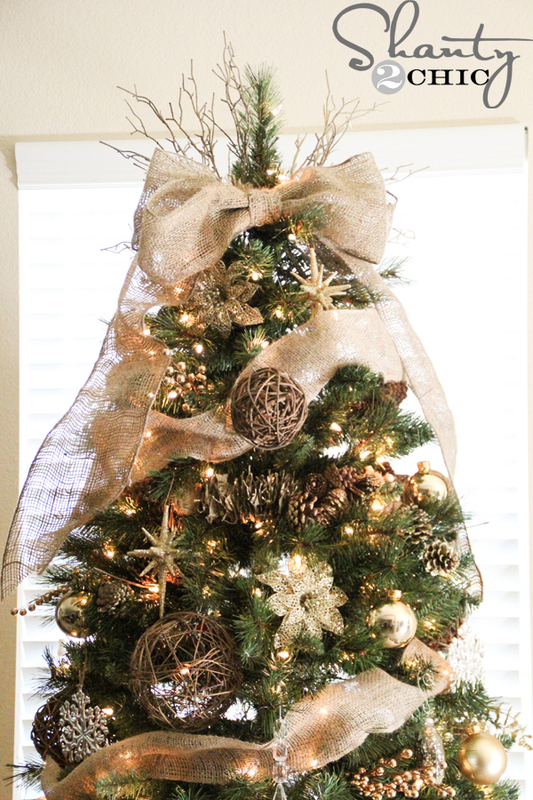 You can use things like tiny wreaths, bottlebrush trees and Christmas tree ornaments. 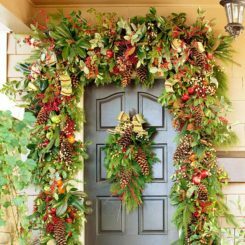 Christmas garlands can be displayed in a lot of beautiful ways. 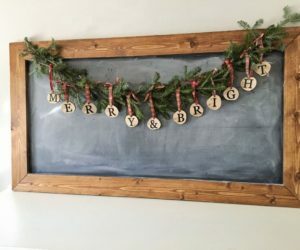 The one shown on angelamariemade is quite small and has tiny wood tags with letters painted on them that spell out “Merry & Bright”. You can personalize these with any message you want. 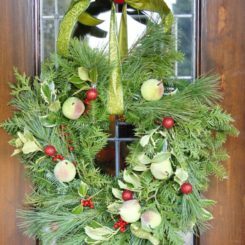 Attach them with twine or ribbon from an evergreen garland. 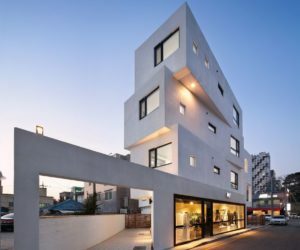 The project featured on titicrafty uses a technique that we like a lot. 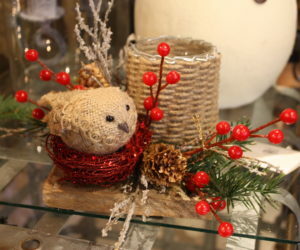 The result is a twine ball ornament. 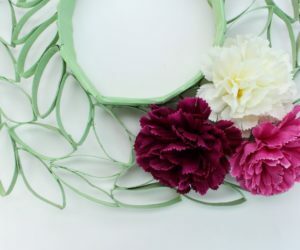 To make one you need twine, glue or mod podge, ribbon, a bowl, balloons and a glue gun. 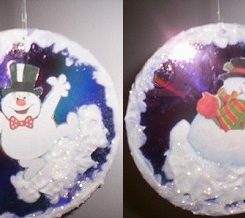 Blow up a balloon to the size that you want the ornament to have, mix glue with water in a bowl and let the twine soak, then start wrapping it around the balloon randomly. 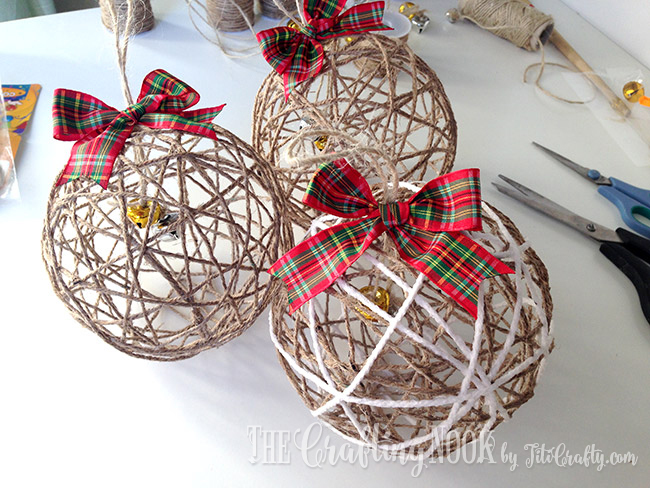 Tuck the end under the twine strings and then hang the ball somewhere until the twine dries. 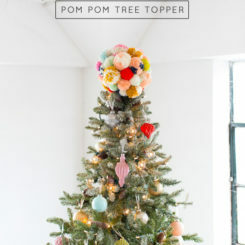 Pierce the balloon, remove it and finish the ornament. 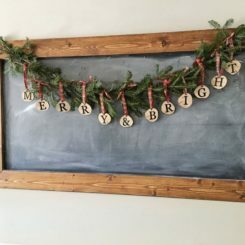 Pretty much anything resulted from working with wood slices has a rustic flair and you can definitely use that to your advantage when planning the Christmas decor. For instance, turn a bunch of slices into ornaments which you can display in the tree, on the front door or pretty much anywhere else in the house. You can even offer them as gifts. 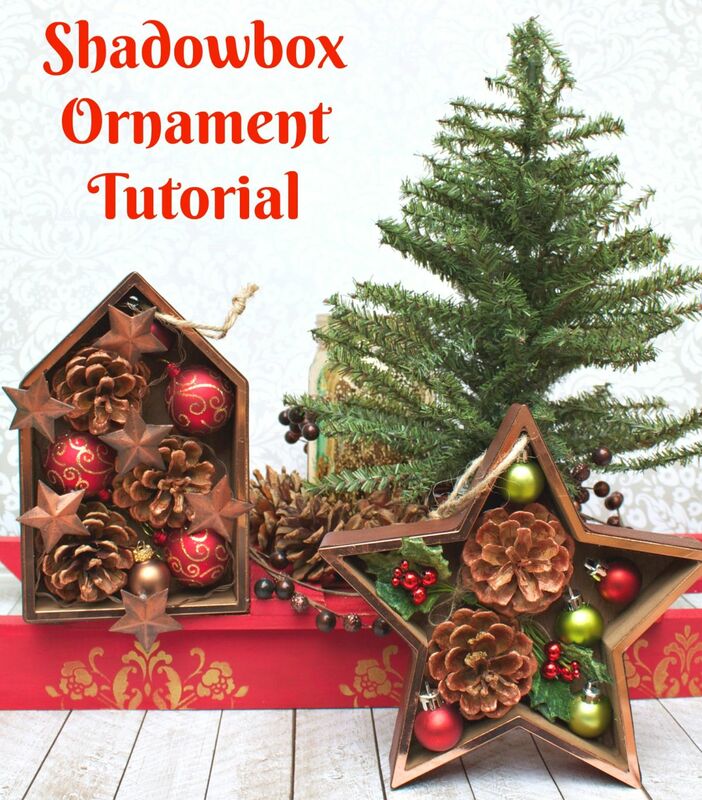 Check out the tutorial from sustainmycrafthabit to learn how to make embossed ornaments. We almost forgot about a Christmas classic: the wreath. 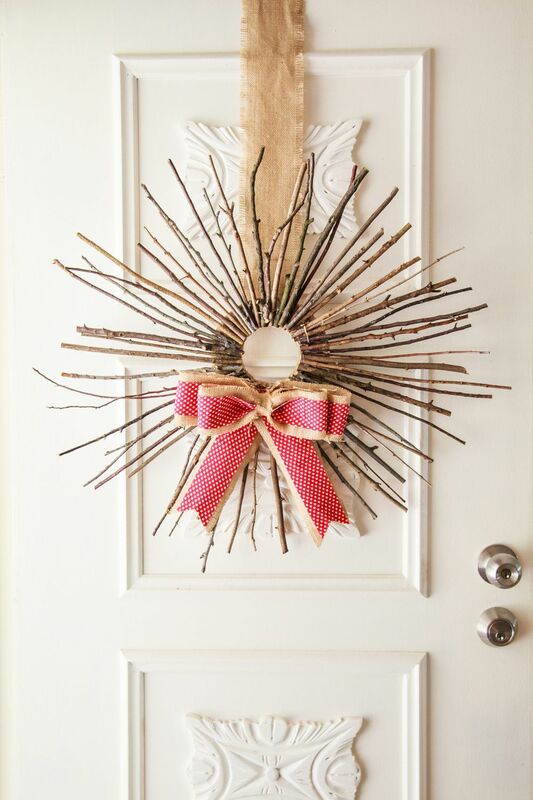 We have something special to share with you today: a wreath made of twigs. 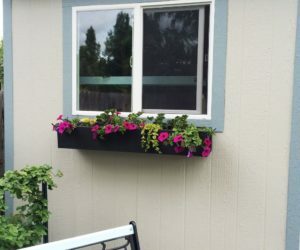 It has a rustic look and it’s pretty easy to make too. You need some cardboard, twine, a bunch of sticks, burlap, ribbon or some fabric and a glue gun. Cut out two cardboard circles and wrap twine tightly all around them. After that, start to glue sticks onto them. The process is described in detail on thewhimsicalwife. 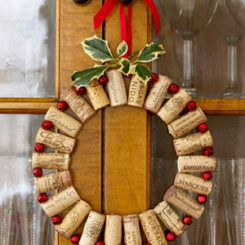 Isn’t this wreath simply charming? Can you believe all that’s needed to make something like this is a wire wreath form and some burlap ribbon? The technique is really easy too. 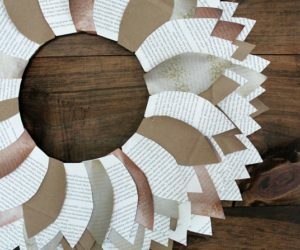 Just run a loop of burlap through the first, second and third slots in the wreath form, as shown in the tutorial from sweetteaandsavinggraceblog. Then squish the burlap to the side and twist. 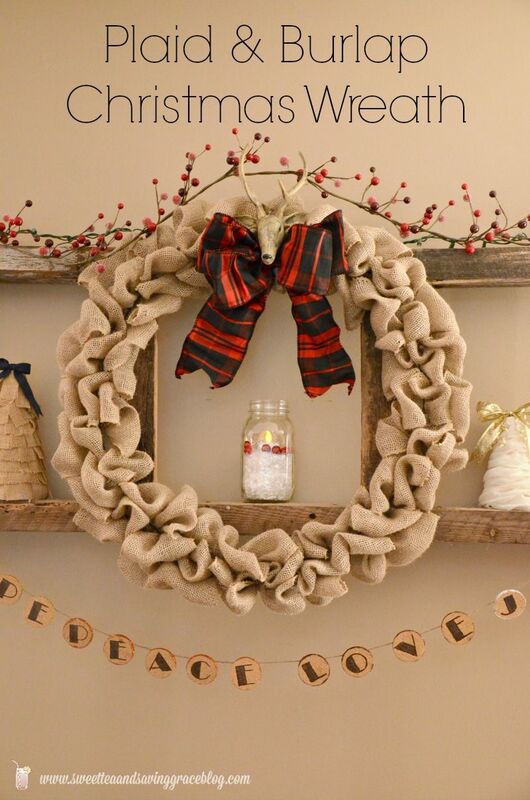 Repeat until you cover the whole wreath in burlap. The Christmas tree featured on sustainmycrafthabit looks pretty cool. 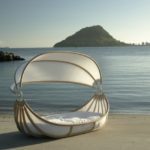 The interesting thing about is that it’s made out of driftwood. 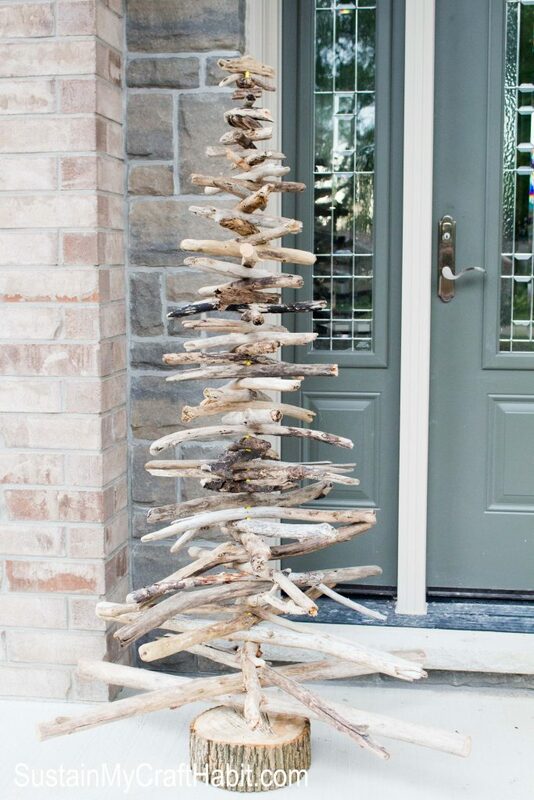 In other words, you’ll need a nice collection of twigs if you want to make a cool and rather unconventional Christmas tree like this one. You’ll also need a long rod to use as a central support and a strong base which can be a piece of a log. 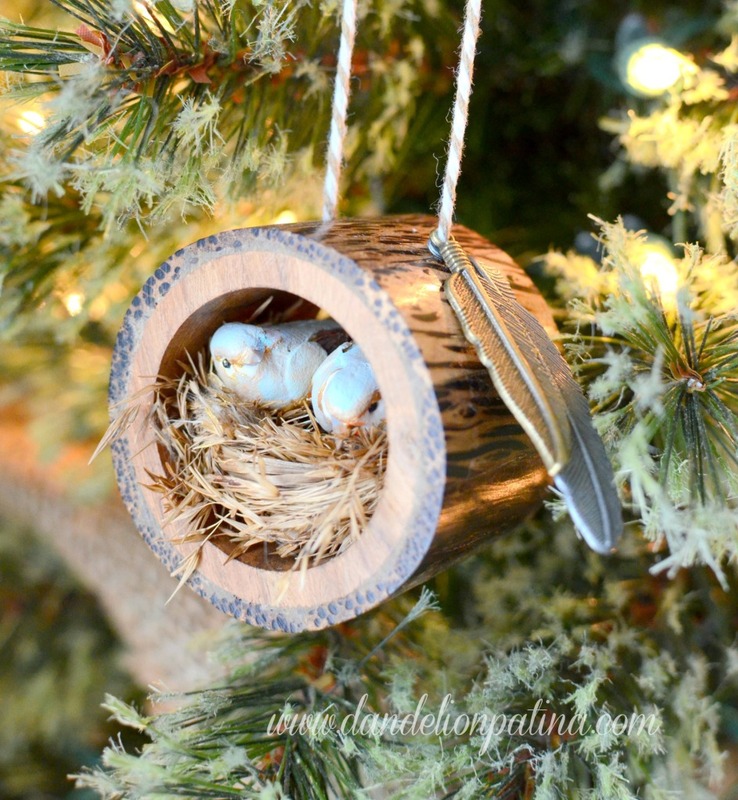 Log slices can be hollowed out and turned into cute bird nest decorations. It’s a pretty unusual idea and we’re happy that we found it. The source is dandelionpatina. The project is fairly simple. First of all, you need to find some wood slice napkin holders (we were kidding when we mentioned the logs – it would be too much work to remove their centers). Drill two holes at the top of each napkin holder and thread some twine through them. Tie it at the top. 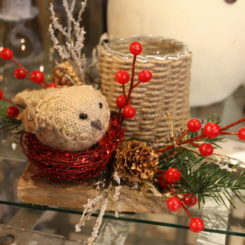 Then put a little bird nest with faux little birds inside the napkin holder. Advent calendars can be a lot of fun to make and they’re nice decorations too. We keep coming back to them because there are just so many nice designs to choose from. There’s one on brepurposed.porch which we find particularly inspiring. The project starts with a wood board, a bunch of wooden clothespins and number stickers. The board is stained and then clothespins are glued onto it maintaining the same distance between them. The stickers are then added, marking each day in December. 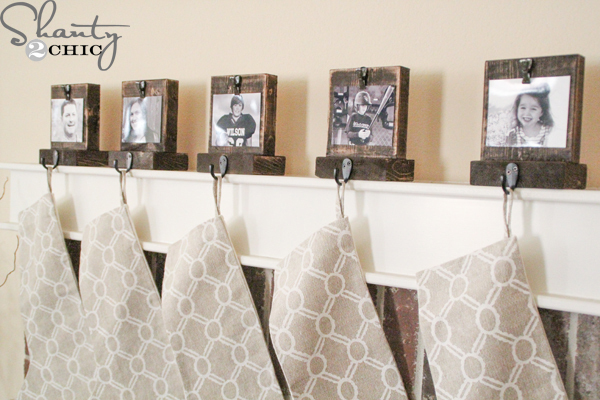 The next step is hanging a tiny bag from each clothespin. Lately, tinsel and garlands have not exactly been popular decorations. The modern Christmas tree is simplified and the focus is on the ornaments and the lights. 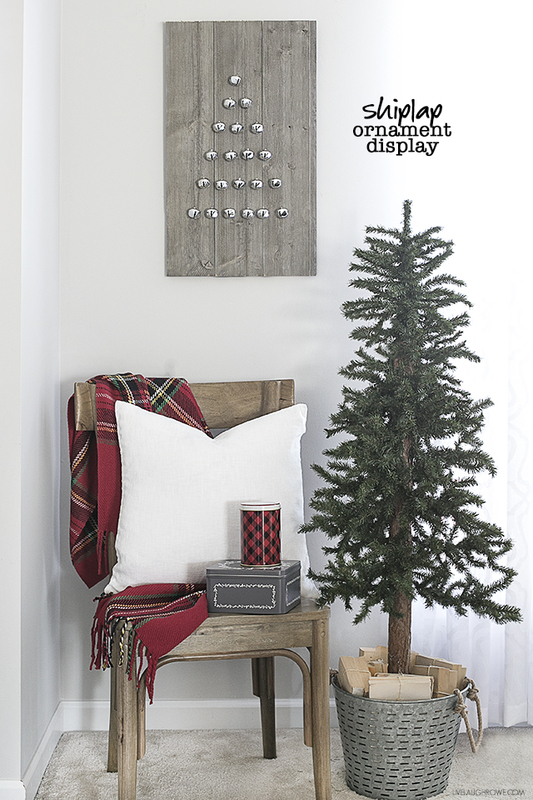 a rustic Christmas tree, however, could use a nice garland. 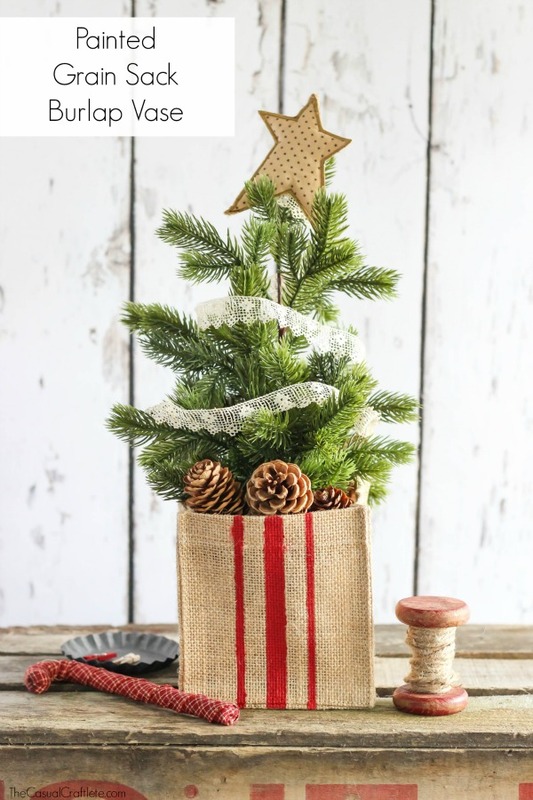 Check out this burlap version which also incorporates a cute topper that looks like a bow. It’s perfect for a miniature Christmas tree. We found it on shanty-2-chic. 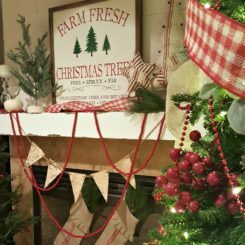 You can’t have a rustic Christmas without hanging stockings from the fireplace mantel. The stockings themselves are subject worth exploring in a separate article. 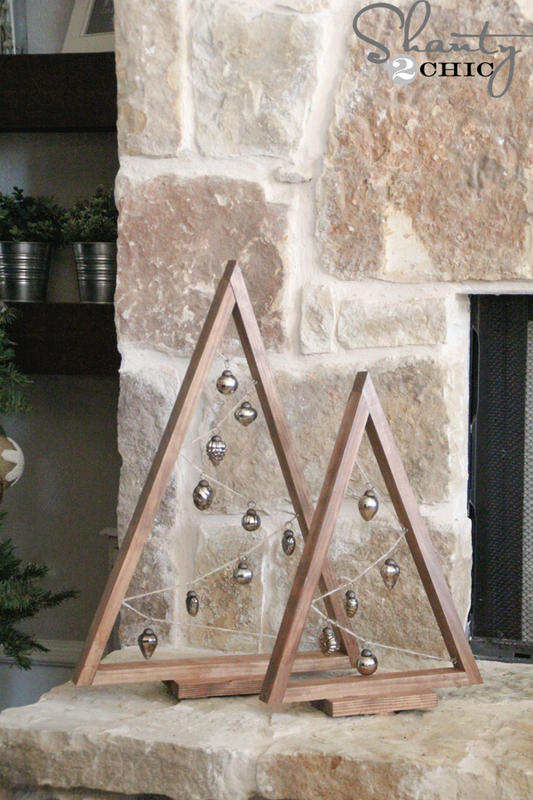 For now, we’ll just show you these lovely stocking hangers that we found on shanty-2-chic. They’re each personalized with a picture. It’s a nice alternative to the usual name tags. 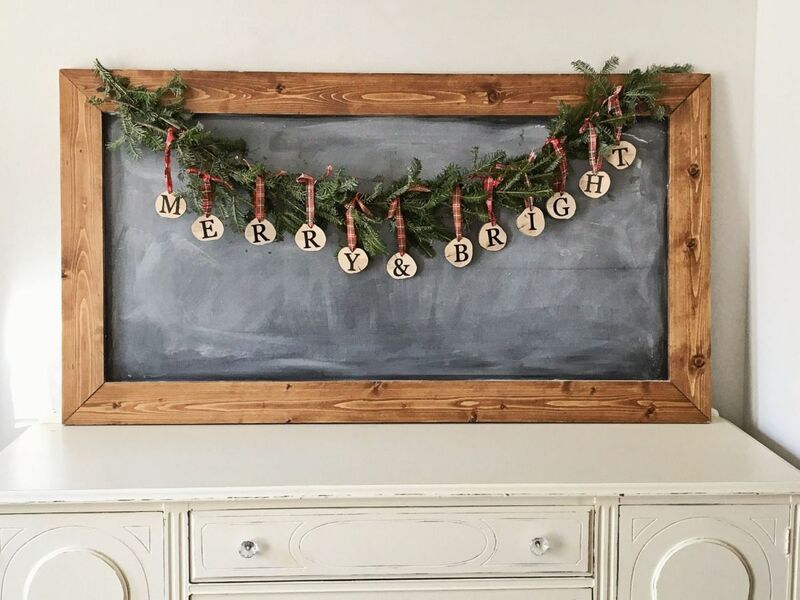 At the end of the day, it’s all the little things that add up to form the big picture so it’s worth focusing on individual decorations like this charming wooden sign which you can display on the fireplace mantel, on a shelf, a console table or on a wall. 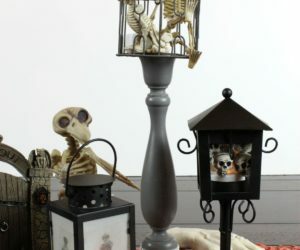 To craft it, you need some wood, a hammer, a few nails, sandpaper, dark walnut stain, white acrylic craft paint, a paintbrush, a stencil, sealer and some twine. You can find the instructions on livelaughrowe. 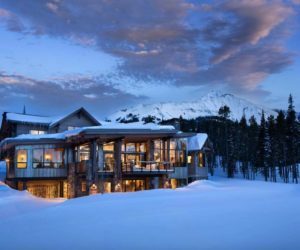 When you think about it, wood in general is quite rustic, especially when in a more raw and natural form. For example, check out these wood log candle holders. 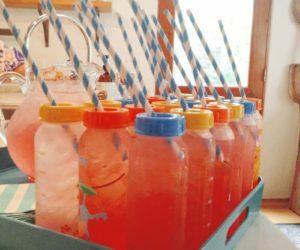 They’re featured on martysmusings and they’re easy to put together using only a few simple things. 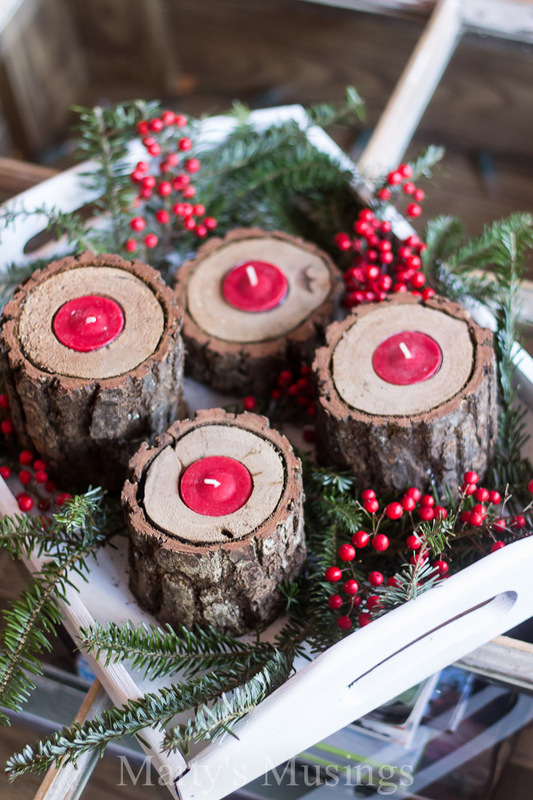 The list of supplies needed for this project includes wood log slices (or a log which you can cut into pieces), a drill, tea light candles, a wooden tray and some ornaments. 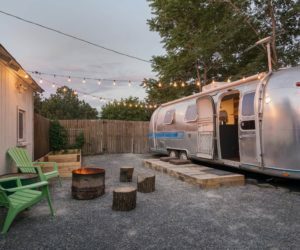 Speaking of miniature Christmas trees, there’s also an interesting design idea on shanty-2-chic which suggests a more minimalist approach. 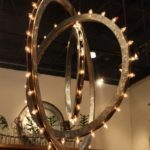 It’s a design which can look equally beautiful in a variety of different settings, whether rustic, modern or traditional. Pinecones and open flames don’t really get along but that doesn’t mean they don’t look cool together. 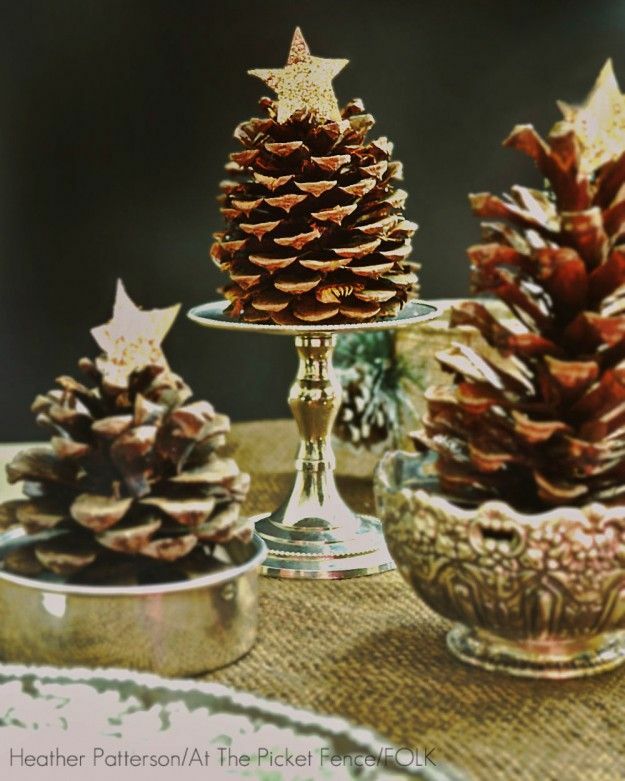 In fact, we happen to love this pinecone candle holder. It’s something that we found on stylizimoblog. It’s custom made to fit perfectly around the candle. You can do that too. 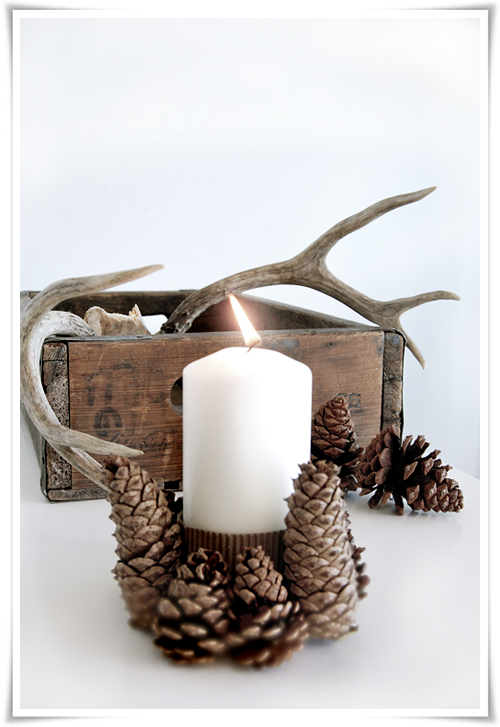 Take a piece of cardboard and secure it around the candle base, then glue pinecones on it. The last project we want to share with you today is a pillow. It’s not just any pillow but a very festive one, with a lovely rustic design. 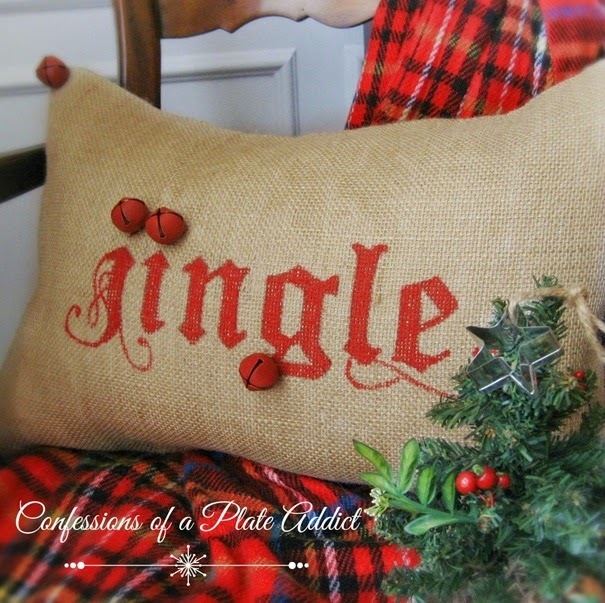 The pillowcase is made of burlap fabric and the “jingle” is painted on. The jingle bells look really cute. Check out confessionsofaplateaddict for more details.